Existing conflicts in the OSCE area remain the most serious threat to peace and security, said Azerbaijani Foreign Minister Elmar Mammadyarov. 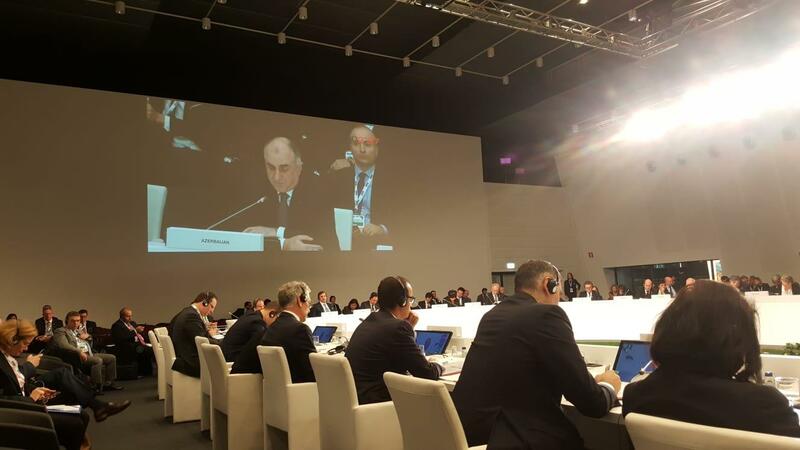 The principle position of Azerbaijan is running in line with the norms and principles of international law, particularly in respect of states’ territorial integrity, sovereignty within their internationally recognized borders, Mammadyarov said at the 25th Ministerial Council of the OSCE in Milan Dec. 6. “Since our last meeting of the Ministerial Council in Vienna, so far we still have seen no concrete progress towards resolution of the Armenia-Azerbaijan conflict,” said the minister. He noted that the fundamental principles of inadmissibility of use of force for the acquisition of territory and ensuing obligation of non-recognition of situation resulting from serious violations of international law and refraining from rendering aid or assistance in maintaining this situation, regretfully, are applied selectively by the mediating countries. “In the meantime, we witnessed consistent attempts of Armenia with active support of their Diaspora continued unlawful practice on altering demographic, cultural and physical character of the occupied territories of Azerbaijan, infringing upon the human rights of hundreds of thousands of forcibly displaced Azerbaijanis, including the right to return to their homes of origin. In flagrant violation of the 1949 Geneva Conventions and their additional Protocols, Armenia has continued illegal resettlement and other activities in the occupied territories of Azerbaijan,” Mammadyarov added. The minister stressed that the unlawful actions by Armenia, including illegal military and civilian build-up in the occupied territories demonstrate its intention and systematic policy aimed at consolidating the occupation and imposing a fait accompli. “These steps undermine trust in the peace process, especially in view of the failure to dispatch an assessment fact-finding mission to the occupied territories of Azerbaijan due to refusal of Armenia,” he said. Azerbaijan believes that there is no alternative to peace, stability and mutually beneficial regional cooperation and is the most interested party in the earliest political settlement of the conflict, said the minister, underlining that the resolution of the conflict is possible only on the basis of the sovereignty and territorial integrity of Azerbaijan within its internationally recognized borders. The military occupation of the territory of Azerbaijan does not represent a solution and will never produce a political outcome desired by Armenia, Mammadyarov added. “I am glad to inform you that yesterday we had very important and useful consultations with the OSCE Minsk Group co-chairs and Armenia’s acting Foreign Minister. For the first time within a year we managed to agree the Joint Statement by the OSCE Minsk Group co-chair countries and Foreign Ministers of Armenia and Azerbaijan. One of the major points is of course intensified and result-oriented talks, including the talks on the high level. I believe whenever elections will be over in Armenia and new Government will be formed we must make a breakthrough next year and build up a good opportunity for bringing peace, stability and prosperity to the region,” he concluded.